For this month's Leftover's Club I was paired with Elizabeth from Cooking with Milton. Aside from our mutual love for blogging and cute dogs, I learned that there is one major thing that Elizabeth and I do not have in common...Elizabeth doesn't have a sweet tooth! Say what?? So I seriously had to think long and hard about what to make for her. 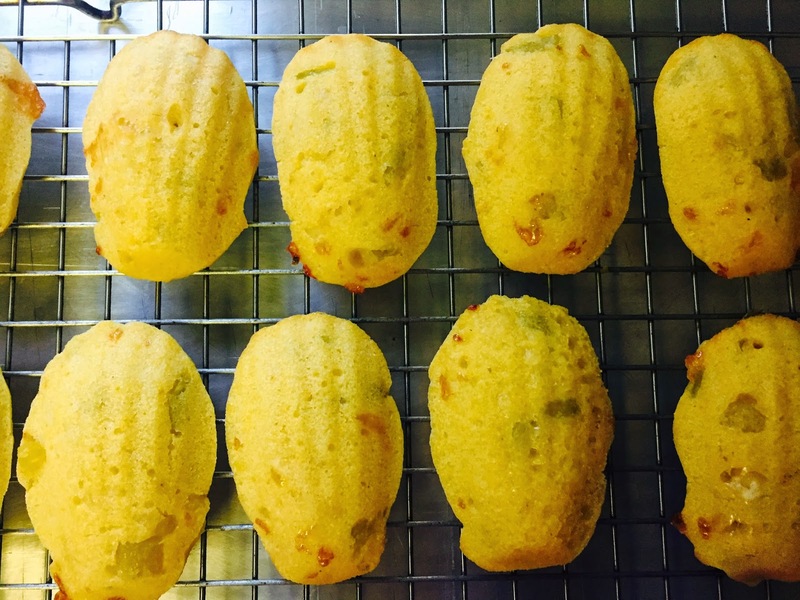 These Green Chile and Monterey Jack Cornbread Madeleines are what I came up with. 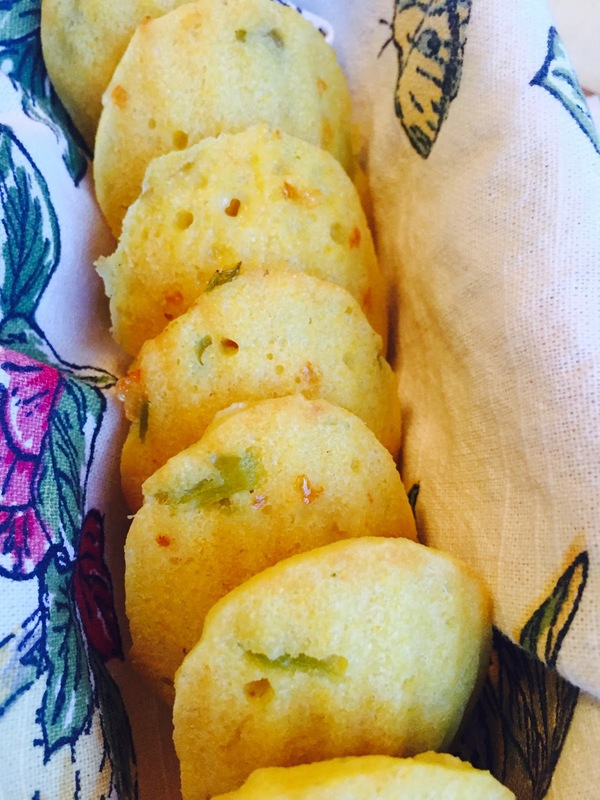 Sure, they look like your typical sweet little, dainty Madeleines but they are made with more traditional cornbread ingredients - a mixture of all purpose flour and corn meal, Monterey jack cheese, green chiles and a touch of honey. 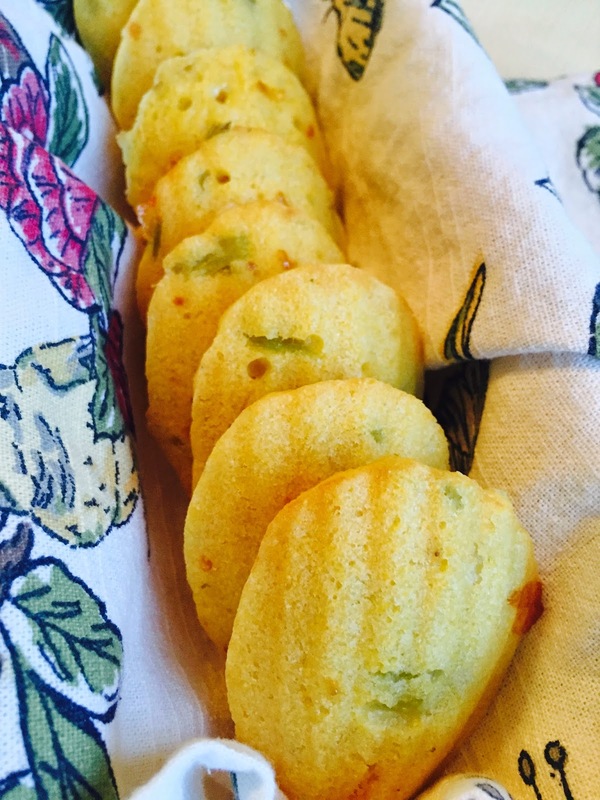 My savory play on Madeleines would pair well with a great big bowl of your favorite chili or a nice, warm bowl of tomato soup. I hope Elizabeth enjoys! If receiving yummy baked goods from fellow bloggers sounds like fun to you, sign up to join The Leftovers Club! Spray a madeleine pan with nonstick spray and set aside. Heat 2 tsp of olive oil in a small skillet and cook the onions over low heat until softened. Drain and set aside to cool. In a separate bowl, whisk together the egg, milk, honey and melted-cooled butter. Add the wet ingredients to the dry ingredients and mix until just combined. Fold in the cheese and green chiles. Spoon enough batter to just fill each madeleine cavity. Bake approx. 10 minutes or until the madeleines spring back when pressed and they are lightly browned. Remove from oven and cool in pan for about one minute, then remove from pan. Repeat process until all batter is used (be sure to cool the madeleine pan before baking the next batch). Serve warm or room temp with butter. Best enjoyed the day they are baked.